Hurricane Frances' wind and water whacked swaths of Florida with fire-hose force Sunday, submerging entire roadways and tearing off rooftops even as the storm weakened and crawled inland with heavy rain in its wake. More than 5 million people lost power. In Daytona Beach, mattresses flew like leaves from hotel windows as Frances roared ashore with old testament fury, reports CBS News correspondent Mark Strassman Its 90 mph winds and sheets of rain pounded Florida's east coast. In some areas up and down Florida's coastline, entire neighborhoods were in tatters. More than 13 inches of rain fell along Florida's central east coast and caused scattered flooding as a weakened Frances edged across the state toward Tampa and the Gulf of Mexico. It left behind leveled trees and power lines, tangled traffic lights and beachfront roads littered with coconuts, avocados and tree limbs. "I was just waiting for the house to blow down," said Diane Wright, who rode out the storm in a mobile home in Fort Pierce. Hers didn't. But even shelters weren't spared: The roof at a school housing evacuees was partially blown off. The storm was blamed for at least one death after a man was killed when his car hit a tree near Gainesville. Frances razed several mobile homes and made a mess of marinas, throwing dozens of pleasure boats against the shore or on top of each other. At 5 p.m., the National Hurricane Center downgraded Frances to a tropical storm, with maximum sustained winds near 70 mph and the core 20 miles east of Tampa. The storm was crawling west-northwest at 10 mph, and forecasters said Frances could regain hurricane strength before renewing its plodding assault on Florida. Initial reports of destruction did not rival the estimated $7.4 billion in insured damage caused by Hurricane Charley in southwest Florida three weeks ago. Frances' path overlapped with some of the area hit by Charley, which killed 27 people. Officials warned the aftermath could pose even greater risks. "There are still dangers on our streets where the hurricane passed," Gov. Jeb Bush said. "Please be patient." Bush and 20 state and federal emergency officials surveyed damage as they flew from Tallahassee to West Palm Beach, but the governor said it was too early to assess the extent of the devastation. A city known for its amusement parks could soon turn into a water park, reports CBS News correspondent Russ Mitchell. In a three-week period, Orlando has been smacked with a one-two punch. First Hurricane Charley, which dumped four inches of rain, and now Frances could bring as much as four times that. Officials say they already feel like they've been in a 15-round fight. "We're good for about 10 inches. Beyond that we are looking at a serious situation for street flooding," Orange County Commissioner Richard Crotty told Mitchell. President Bush talked to his brother from the White House on Sunday afternoon to assure Floridians that federal resources are in place to help respond, White House spokesman Trent Duffy said. Some 8,000 members of the National Guard were assigned to aid recovery efforts. Suspected looters were arrested in Palm Beach, Orange and Indian River counties. Once a Category 4 hurricane with winds of 145 mph, Frances slowed and weakened to a Category 2 storm as it neared Florida. Winds receded to a peak of 105 mph before it made landfall at Sewall's Point, north of Palm Beach, around 1 a.m. EDT. One gust was clocked at 115 mph. "We don't know what all of our damage is yet, but we know it could have been a lot worse," Martin County administrator Russ Blackburn said. At a park with 120 mobile homes in north Fort Pierce, residents were glad the damage wasn't worse. About 12 trailers were heavily damaged, several of them razed to their floorboards. Timothy Fellows emerged from the storm to find a neighbor's trailer demolished but only a fence down on his property next door. 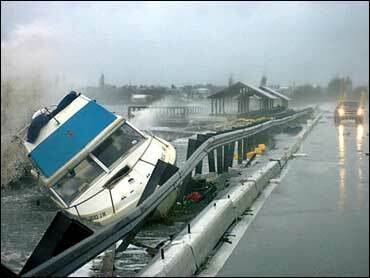 "My trailer survived!" the barechested Fellows shouted as he walked through his yard. "Because I believe in God. Even my mailbox survived. That tells you something." The storm shut down much of Florida on the traditionally busy Labor Day weekend. The largest evacuation in state history sent 86,000 people to shelters. Airports in Miami and Fort Lauderdale reopened, and officials in the two counties told evacuees they could return home. Miami's airport was crowded with tourists whose vacations were ruined or interrupted by Frances. "I think it's a big fuss over nothing," said 35-year-old Geraldine Lamb, who was visiting from London. New evacuations began in four counties in Florida's Panhandle, where Frances is expected to hit Monday after crossing the northeast Gulf of Mexico. The most likely location for landfall was St. George Island, forecasters said. The scope of the enormous storm was evident Sunday as bands of rain and gusty wind extended the length of the state's 430-mile east coast from the Keys to Jacksonville and beyond along the Georgia coast. It was expected to move into the panhandle Monday, then into Georgia and Alabama. Earlier, at least two deaths were blamed on the storm in the Bahamas, where thousands were forced from their homes. Florida Power & Light, the state's largest power company, said more than 5 million people lost power, but crews began restoring service in some areas. Among those without electricity was most of Palm Beach County, population 1.21 million. Northbound Interstate 95 was closed in Palm Beach County because of a washout. Authorities closed the majestic Sunshine Skyway Bridge across Tampa Bay. In Martin County, 630 evacuees at a school were forced to another shelter when part of the roof blew off, flooding 16 rooms. Heavy rain transformed some neighborhoods into waterfront property. Roads in Palm Beach County were covered by up to four feet of water, flooding cars up their headlights. Neighbors waded to each others' homes after being shuttered inside for nearly 24 hours. "All our trees are down and I have a few windows broken, but I don't know what else is flooded because I can't get anywhere," said Carline Cadet, waving at the water covering the streets around her home. Police in the Orlando area said 10 thieves used a stolen car to smash into a store and steal about $10,000 worth of clothing, and two men were arrested as they tried to steal an ATM machine with a chain saw. Also Sunday, at the peak of the hurricane season, Ivan became the fifth hurricane of the year in the central Atlantic. It was about 820 miles east-southeast of Barbados with winds near 125 mph, but officials said it was too soon to say whether it would hit the United States.